One of the recurring themes in YANG’s work is the urge to emphasize with an irreverent attitude the many contradictions and derangements of society, aberrations which can only be dealt with by playing with them, turning them into seemingly innocent games or funny scene. Another theme central in YANG’s research is the (mis)perception of space and its political and psychological appropriations. 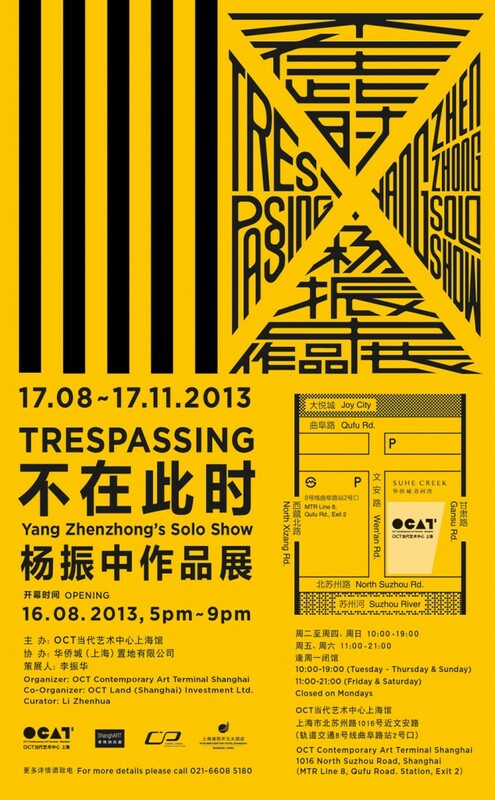 The site-specific work Trespassing should be conceived as an all-embracing pedestrian crossing in which the typical pattern of black and yellow stripes covers the entire area of the installation which is designed to be walked through and explored. As soon as the viewers enter the space, they receive a sense of displacement, as if walking on top of automatic traffic barriers, as well as the possibility to overcome physical limits and transgress spacial norms. YANG’s urge to achieve a deeper understanding of society and its spaces (both physical and conceptual) can be seen in the desire to actively involve the visitors. The apparent mismatching of the English and Chinese titles of this exhibition activates an even deeper level of meaning. While the English title refers to disrespect of normative laws regarding space, the Chinese one alludes to time and can be literally translated as “not at this moment”, which hints at a missed correspondence or intentional absence. Still, the two titles prove to be complementary: “Trespassing” allows us to be where we should not be, to go where we are not supposed to go. Definiteness of time is sacrificed, but corresponding space is compensated. Born in 1968 in Hangzhou, Zhejiang Province, YANG Zhenzhong has been living and working in Shanghai since 1997. One of the most important artists in the area, he has curated and organized, along with other local artists, a dozen of highly influential contemporary art exhibitions in the past dozen of years. They have not only enlivened the atmosphere of the new media art industry in Shanghai, but also helped with the promotion of the artist himself onto an international stage. YANG has previously displayed in a string of exhibitions including Venice Biennale, Shanghai Biennale, Asia Pacific Triennale of Contemporary Art, Lyon Biennale and so forth. His works can also be found in collection of significant public and private institutes such as MoMA New York, IKON Gallery (UK), Fukuoka Asian Art Museum, Musée National d’Art Moderne and the UBS Collection. Support: OCT Land (Shanghai) Investment Ltd.